Chinese investors are paying close attention to North Korea's economic situation in search of potential business opportunities after the historic meeting between the leaders of North and South Korea. Economic cooperation between China and North Korea may pick up as soon as the UN Security Council begins to loosen economic sanctions against North Korea. The leaders of North and South Korea have pledged to work for complete denuclearization of the Korean Peninsula. This will not necessarily lead to a shift in attitude from the UN, but we see hope. The situation on the Korean Peninsula is changing. So what should Chinese investors do? Close attention needs to be paid to research and analysis on possible changes of North Korea's laws and regulations relating to foreign investment. North Korea has made economic growth the nation's new top priority. It's highly possible that Pyongyang will soon give more details about its economic development plan, in which attracting foreign investment may be an important part, because these efforts will allow the nation to earn some foreign currency. China is North Korea's major trade partner. Chinese enterprises may have an edge over other foreign competitors in North Korea, but it will not be smooth sailing if Chinese investors don't learn from their previous mistakes. Chinese companies are easily attracted to new investment concepts, so there may be an investment boom connected to North Korea's possible economic reform and opening-up. Well-laid plans and cautious approaches will help curb irrational investment. 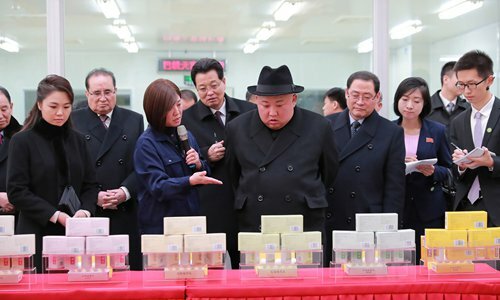 Some Chinese companies doing business in North Korea's special economic zone (SEZ) have suffered losses over the past few years. If North Korea wants to further open its door to foreign countries and attract more investment from China, the two sides may need to rethink the SEZ strategy to make North Korea more attractive to foreign capital. China will likely be willing to offer assistance to help its neighbor improve economic conditions. Investors in China are drawing up detailed plans to take part in North Korea's possible economic reforms, but most of them are currently taking a wait-and-see attitude. China will continue to comply with UN sanctions on Pyongyang. Meanwhile, the US has cracked down on some Chinese enterprises such as telecom equipment manufacturer ZTE Corp after it declared they had violated sanctions on Iran and North Korea. Chinese companies must find a way to avoid this happening again.